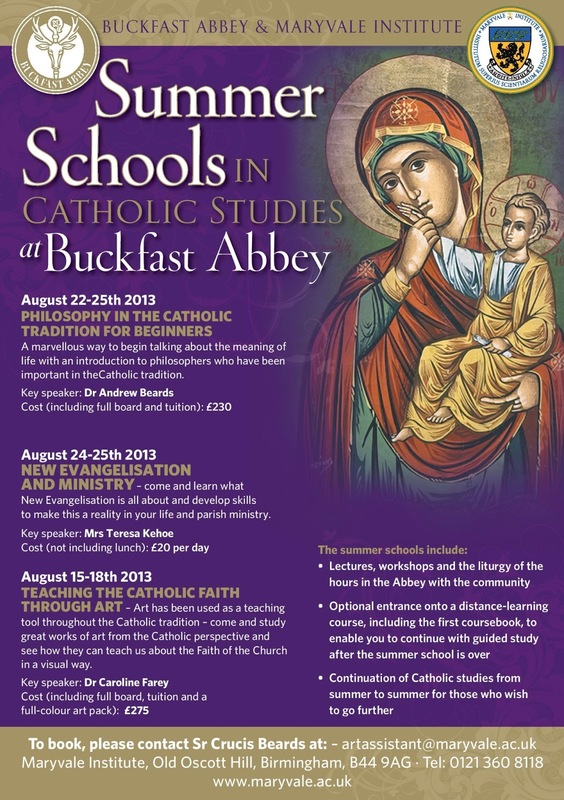 Taking place at Buckfast Abbey, a Benedictine monastery set in the beautiful Devon countryside, the Maryvale Institute has offering a short residential summer school that will take place in August and which offers you the chance to study Catholic traditions in art. Called Teaching the Catholic Faith Through Art it is held at Buckfast Abbey in Devon (there are more photos of the abbey in its setting at below). 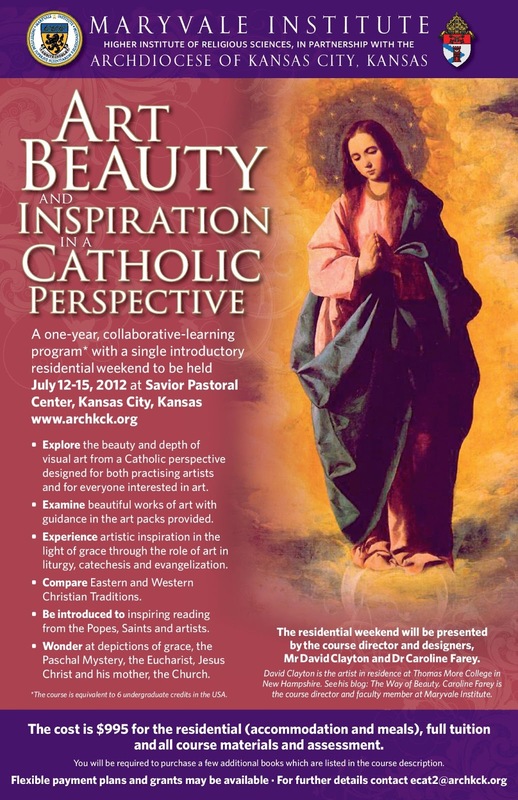 It is taught by Dr Caroline Farey and myself and those who attend have the option to deepen their studies afterwards by enrolling on the degree level diploma, Art, Inspiration and Beauty from a Catholic Perspective. The cost for the weekend including tuition and full board is just 275 GBP and the dates are August 15-18th. Readers on this side of the pond who might feel that its too far to go need not be discouraged: as some of you will already know, this course is also offered in the US also. The residential weekend is in July at the Maryvale Center at the Diocese of Kansas City, Kansas. As well as this course about art theory, in Kansas they are offering a 5-day course in which students can learn to paint in the style of the illuminations of the English gothic psalters, such as the Westminster Psalter. Beginners and experienced artists welcome. Posters for all three are shown below, and from these you can get the contact details. The Maryvale Institute is the only Higher Institute of Religious Sciences in the English speaking world that has full pontifical status. 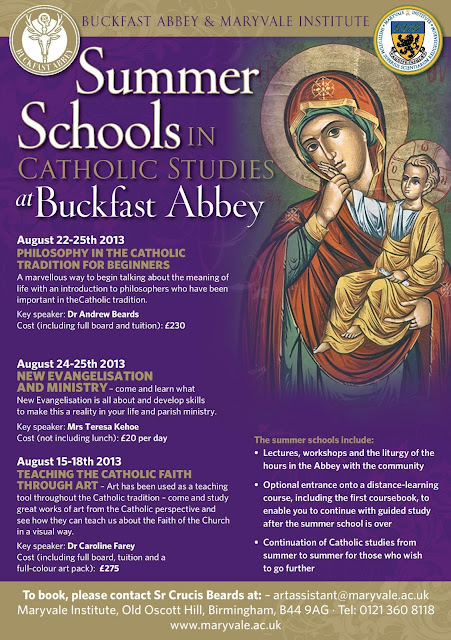 Below and top: Buckfast Abbey, a Benedictine monastery in the Devon countryside.